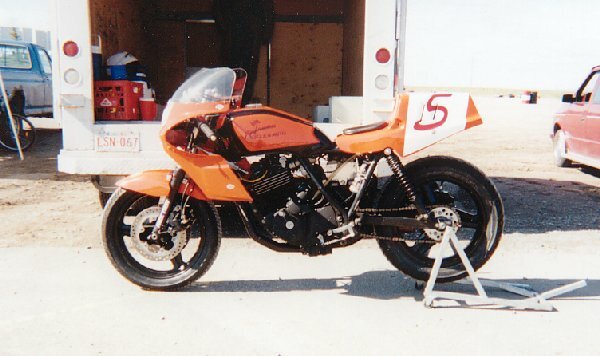 One of the bikes was a 1984 Honda VT500 Ascot. I had never seen one before, and my first impressions were along the lines of "Jeez that looks ugly". But that motor did look good. Fast forward to this year's Bull City Rumble in Durham NC. I was strolling around with a mate of mine who happens to be a custom bike builder of note. We came across a stock VT500 and I asked him what he thought of it. His verdict was that it would make a fantastic cafe racer. So I called up my mate Bill from the challenge and mentioned that if he was ever thinking of selling I might be interested. Long story short I now own it. First order of the day was to get all the bodywork off to see what we are dealing with. I haven't got a final concept fully baked yet, but if you stay tuned you will see how this will develop. First step was to get all the main body work off to see what we are dealing with. I switched out the stock bars for an old pair of drag bars just to bring the handles down. Nice Donor Bike! Be careful with those body pieces, side panels & gauge cluster. They are eBay gold. Good luck with your project. I can't wait to find out what your plans are. Interesting to hear about the body panels. They will be sold at some point.....to fund this project! Thanks for the info on the Mac pipes. I don't plan on re-using them so they will probably be sold too. They are a bit rusty in places, but could certainly be rechromed or ceramic coated. Here's a couple of ideas of what I am currently thinking for this build. Pretty radical styling change but I think it's totally possible. I removed the lower exhaust pipe just to get an idea of what one pipe each side could look like. I borrowed a Ducati Supersport tank from a friend. It has a nice big hollow underneath and follows the line of the frame nicely but would need some mods to get it to fit down lower on the frame. It's also too wide at the front end so would interfere with the handlebars. Dropped the forks 3.5 inches in the trees and tried my Suzuki GT750 tank for size. Would be an easy fit but IMO does not look right for what I am after. I love that GT tank on there. I have a GT in that exact same color. I wonder how an early CBR/Hurricane tank might look? I think they're more slender at the top. Looks like you have to decide if you want a Super-Bike type of look where the top of the tank is fairly flat & the back of the tank drops down like the first picture. Or the more traditional CAFE or Tracker look where the tank is flat along the bottom & the line extends back to the seat/tail-piece section. I think the second option would be easier, but it is also the most common. I'm surprised that you are finding tanks that have a large enough tunnel underneath to clear the backbone framework of the Ascot. Of course the original Ascot tank has very clean & attractive lines to it, but that pretty much locks you in to a Tracker look. I found this old picture of an FT racer a while back that reminds me of the direction you're looking to go. Looks great! I wonder what forks those are. I would like to keep the stock wheels so would be good to know what forks would be compatible. Those are probably Honda Hurricane forks. They fit into the original FT500 triple clamps. Those wheels look like Hurricane wheels. 1. Look for forks that will fit the Ascot triple clamps (37mm). I'll look into Honda Hurricane or similar. 2. Find something with a longer stem. You should probably try to stay within the Honda family if you can. Another favorite swap is GSXR forks. They seem to be more available than any of the other modern front ends. You want to try & source the whole thing from the wheel to the clip-ons/handle-bars & hand controls. Later on you can sell what you don't end up using. Good luck, I'm real interested in what you end up using. Thanks for the links. I had the AllBalls conversion site bookmarked from previous builds, but it does not consider steering stem length. So I've found Axle Diameters, Steering Stem Bearing sizes and fork stanchion diameters, but nowhere can I find a list of steering stem lengths. That would be the last piece of the puzzle! The first generation Honda CBR Hurricane has 37mm upper fork tubes if I recall correctly. The complete front end also has the correct fork tube spacing to slide right up into the earlier single cylinder FT500 Ascots triple clamps. I do not know if the VT500FT & the FT500 share the same triple clamp spacing. There are a few specialty companies that will press the original steering stem out of the lower triple clamp & press it into the new lower clamp if the diameters are the same. If the steering stem diameters are not the same, you will either need to turn it down or bush it up to fit the new lower triple clamp. Then you may need to bore out or bush up the top triple clamp. Most any "good" local machine shop should be able to perform these fairly simple machine operations. You need to approach them with cash & try to speak to the owner directly. Casually mention that you will pay in cash & do not require a receipt. Many times a shop owner will take on some small one off job for cash that he can put in his pocket. J, could you measure the distance between the triple clamps on your FT and let me know? If you measure from the top surface of your lower to the underside of your upper, then I can compare with the VT. Thanks! The VT500FT sure has an elegant looking engine! Do you have any plans in trying to remove the swingarm, or to swap a Shadow rear-end on to your project? The Shadow came with a 16" rear wheel & has a slightly higher gear ratio. Some guys swap the Shadow rear-end onto the Ascot with the 18" rear wheel to pick up some more top end speed & a better cruising speed. Well I tried to take some accurate measurements off my FT500, but I had to eyeball it a bit due to parts of the bike being in the way. The distance between the triple clamps from bottom to top varies depending upon where you take the measurement. Along the left upper fork leg looks to be about 6" & 5/8ths of an inch from the top of the lower triple clamp to the bottom of the upper clamp. The distance between the forks inside to inside is approximately 5.725" on my "el cheapo" 6" digital caliper. As I said... There was a bit of eyeballin' going on, so these may not be 100%. If you need any other measurements or pictures, just let me know & I'll see what I can do. PS. How well does that Bike Lift work for you? How high does it lift the bike & do you recommend it? Been thinking of picking one up from Harbor Freight. J, many thanks for this info. It will be close enough I believe. I bought the lift from a friend of mine who upgraded to a Kendon. I find this one very useful. It will raise the bike about 2 feet when you have it under the motor. I also made a timber "platform" with wheel chock and I use the lift under that to get the whole bike up to a good working level. If you look closely at the pic you will see two arrows which are the guide marks to get the lift in the right place. Nice looking RD project. I have one of those also. They are my other "favorite" bike. Pretty cool bike lift you put together. I might have to try something like that. Sure beats being hunched over all the time. Got some measurements off the steering stem. It is quite a bit longer than the FT. I can't find these corresponding dimensions for other bikes listed anywhere online so it might be a case of carrying a measuring tape around at the next bike meet! I could also have the VT stem remounted in a different lower triple clamp. If anyone knows of other bikes that have a similar long stem I would be delighted to hear from you! Are you looking to go with the new style inverted forks, or the old style standard forks? I think I would look for either a CBR, GSXR or Ducati/Aprilia front end & have the steering stem swapped. I've seen some good prices on Ducati front ends on eBay. Most of the Sport Bike forks are a few inches shorter & will not only lower your bike, but also quicken the steering some. What is the spacing between the forks? Between the forks is 145mm (5.71 inches). I'm thinking about sticking with old style forks. I think they will fit the overall look better. Would likely also be less expensive.